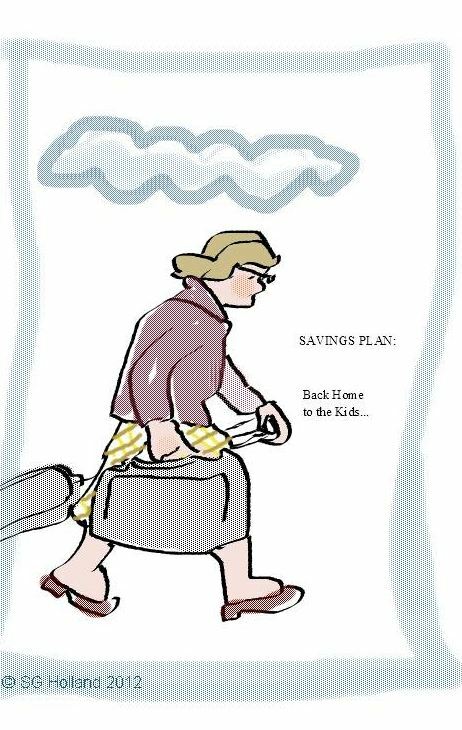 Seniors have plateaus just as growing children do, only in reverse. They grow smaller, blinder, deafer, more forgetful and then they begin walking not so well. They have been depending on the Social Security system to keep them through the downward spiral and tuck them in at the end in some sort of respectable way— not a mass grave or dumpster. That’s pretty blunt, isn’t it? Well, blunt is the blow, I am telling you from my current viewpoint, being at the flat part of a new lower ledge of the series of plateaus. When beautiful winter makes you stiff and exhausted and unable to keep your own fire stoked, it IS a blow. Instead of inviting folks to come by and warm themselves, you find yourself hunkering as close as you can to a frail little lightbulb, and if you are lucky, your grown children recognize that you need a REAL fire, since you have nearly totally lost your own. My travels (the other side of the story–did you click the link in the title?) have taken me on journeys rewarding and then other journeys that were clearly designed to be instructional, often with a large discomfort factor. The counterpart to Hestia , the stay-by- the-fire goddess, was Hermes the traveler-adventurer god, strikingly different from Hestia, but a very close friend and neighbor to her.they were a duo who were the best of friends who did not marry and likely would never have been compatible mates, so different were they. I think I’ve got some humanoid (sub-godly) traits of each of these opposites and I am now traveling from Hermes-mode back into Hestia-mode for the preservation of body and soul. I am not alone. The economy, you know has yanked the rug out from under many hard-working retirees. And the cruel winter just past, and the inability of this 74 year old body to spring back in the expected way it always has — it’s a rude surprise that happened in one winter’s time. Mortality is a subject that comes into stunning focus maybe once or twice during most folks’ lives, especially when a “close call” happens or when a dear one dies. Most of the time we let the matter of death simmer quietly on the back burner to be dealt with “later.” It’s not number one on our list of favorite things to plan for. Once we have the matter of soul settled, we relax. A winter like the once we just had in 2011-2012 brings the motality matter into sharp focus. When one has no way out of the cabin but to stumble down the moutainside a quarter mile in ice covered snow up to the knee caps, and one has a trick knee that will not operate properly on the downhill slope. It’s cllimbing down a steep slope so you can get to your car parked in a plowed area below. Then you dig out your car, and go to the store and get supplies. Then you park your car where it was before and get to carry the packages of supplies back up the mountain, and you have to stop every five steps to catch your breath. This is not ordinary outdoor fun, it’s a real test of your physical plant, and my body did not pass it well at all. I really did feel as if I might die. I actually imagined that the local mountain lion might be considering me likely prey (wounded small mammal), and be planning his attack. I tried to make myself look big while bending over to catch my breath. I dragged my groceries rather than carry them, and I said loud things in all kinds of voices, mostly gruff. I tried to sound as big as God. “Mom, we have to get you OUTTA there,” the kids said. And they were right. So my primeval wonderland is standing out there looking in my big windows, looking at me with sad leaves and the birds are gone because I have weaned them away from regular feedings. The intimacy I have enjoyed with the forest spirits– plants and animals– is being stressed now with the reality that I am having to pack up my belongings and journey away from them. I do remember that comforting hearth, and the groaning board, and the laughter and pranks of my dear ones around the room. And now my young are strong and seem to have endless energy to fix, and do, and make. Yes, I will, as they suggest, come there and stay a while. The love has changed hands so often between me and my children, and has been so thoroughly tested by fire and has come through stronger because of it, that I am secure in the bond, and content to lay aside my traveling cases and rest at their hearth and learn their new foods and teach their new generation the old stories. They can afford me, they say, and I can come and rest there until my strength returns so that I can at least do the things I do well. They will do the things that are too much for me now. And it is with honor that they receive me at their table. Have Lap Pool, Where to Travel? Old Swimmer is Currently in Dry-dock. Here I am, wanting to get into the water and be toning my muscles after a long time being ill and inactive. I have this IPool thing (no, it’s not a tech gadget.) Anyone familiar with a so-called Lap Pool can imagine a smallish one, just large enough for a person to tether themselves to an overhead hanger and swim forward, getting nowhere, as far and as long as they wish. The pool has a filter and a heater, and even a security cover! I was told that once one knows how, it only takes thirty minutes to set this thing up! Then fill it with not very much water (maybe three bathtubs full? ), bring the water to an acceptable temp, and get in! I have never gotten it set up! Ever! I’ve carted it from NJ to Shelton, and then to another place in Shelton, and then to Hoodsport, and now I’m headed to Seattle in what I hope will be a more permanent move. Its parts are still encased in the original plastic protective wrap except for the sturdy, powder-coated heavy metal tubing supports, which have already proven their worthiness by enduring five or more winters without rusting. It just needs a flat place to be set up. Seems that no one wants my pool set up in their spaces. I have four professional construction geniuses in my list of kids, but no volunteers for this project. (..”we have no room,” ” there’s not a safe place, ” ” there’s not a private place, ” etc.) Another thing they say is “SELL IT”. Well, I like it and want to have it in my life. The way I got to where I am is by swimmming off the effects of childhood polio, and building up a good body that has served me pretty well until recently. I really need to get in the water again, and I know I will not do it if I have to GO somewhere in the CAR (gas), and be a member (pay), and then get dressed in damp clothes afterward and GO back home in the CAR(gas), and disrobe again and probably not do anything more …just take a nap. The getting there is just a huge chore! And I’ll opt out…I will certainly opt out. If I had this little pool convenient, so that I could dump myself in it before breakfast for a half hour or so and wake my body up in warm water with stretching and strokes and exercise that doesn’t jar my joints– I could then just go inside and quickly dress in DRY clothes and get about my day. That I would do. And I need to. I find myself imagining the littler grandkids using it for recreational purposes, and the older grandkids and my own middle aged kids and me using it for a hot tub now and then. Most of all I imagine myself lying on my back in the water in the middle of next winter with snow coming down…and I’m catching snowflakes in my mouth! It’s so wonderful. Won’t anyone put up my pool? I’m not in a house-buying, or condo-renting mode right now, and likely will not be again unless something dramatically enriching happens. So I need a space maybe twice the size of a standard full bathroom that can be fitted with some planks lying flat, and some access to electricity. A hose is fine for the water. This pool was bought for me during an epoch that ceased for many reasons… and it was clear that I was to have the pool with me wherever I went. Everything is right about this except getting the thing up. There will be a sequel to this post sometime. And pictures, if it is a happy ending! Addendum: No pictures. The lap pool was put on craigslist and in the process of being sold was found to be less than perfect for its bumped around life. My next option is to use my grandson’s apartment indoor pool, which is much more enticing, but a good car-trip away…therefore it costs me gas to go there. More coming on this as the exciting saga develops. The Cycle … It’s Just a Carousel Down Here On Earth! Certain things happen over and over again, even if you don’t want them to. Or even if you want them to, they happen very often at the most surprising time– or at least sooner than you would like. Or later. Like weather does. 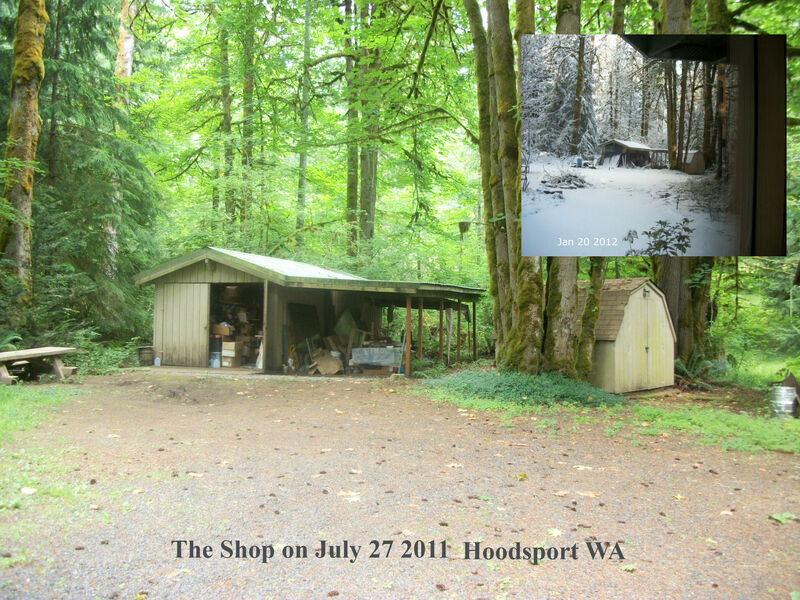 What you see in the large image is what the shop looked like about 10 weeks after we moved to this remote cabin about 800 feet up in the Olympic National Forest foothills. A perfect spot for making art and carving bowls. The boxes you see in there are unpacked items that had not yet found a good place to land, and the mess in the carport was stuff left from the previous tenant(s) who have enjoyed this property over its forty some years of existence. The picnic table is sitting at that odd angle with its nearest side missing its bench board, because of the many times the driveway there has been badly flooded with run-off from the high mountains over to the left. In rainy seasons, endless water comes from those hillsides, and in spring snow melt makes it even more dramatic. The picnic table just kept sinking and sinking, and its big bolts rusted out and the wood expanded and contracted and then split, leaving the bench on the ground and rusty bolts sticking up at people contemplating finding a seat. I find this table indispensable for outdoor carving and other messy projects. I am indebted to the landlord for refusing to move that table (as if anyone could move it without simply sawing it up and burning it in the fire pit.) He knew how handy it always had been. As you see, July turned into January of the following year, and the records will show that we had a record breaking winter storm during the first part of January which dumped well over a foot of snow all over the place.. over our trees (some of the well over 100 feet and with limbs stretching well over fifteen feet laterally, with lots of good surface footage to collect heavy loads of snow), and piled up an extra-huge layer of white on the picnic table. Attatched to the building there are tarps to direct the wet or frozen material from the eaves to somewhere outside the unsealed base of the building. The floors are not graded, and water likes to run inside. It is a garage, after all, most people think! I have been maintaining two moats that go abreast of the building– the one of the left is currently a swiftly running river which, by human design, skirts the underpinnings of the building and sends the rushing water off into the woods as it slopes down behind. On the right side is a smaller moat leading from the flood-prone graveled area to a groove dug around the periphery of the carport, which also (if debris is kept clear) moves toward the back of the building and then down the gorge to the right. I have no idea where it goes from there, but am just happy to see it not staying near my shop for any length of time. The cycle of seasons is clearly a life-principle that reminds us mortals that there are systems that we don’t control. And the same sorts of things happen in all realms of life, for better or worse. The repeat of relationship dysfunctions insists on reappearing time and time again. Even through generations, things happen a certain way because they ALWAYS happened that way in a given family. Opening one’s eyes to see the patterns is very difficult. And while it is difficult to understand the pattern as regards other people in an “off” relationship, it is nearly impossible to get any objectivity as to one’s own patterns within the cycle. Dance of Anger is a helpful book. Case studies on close relationships that are awry– and the story of how certain people approached mending this. I am by nature a person who abandons things I cannot solve. Really. No wonder I have several really special friends who have accused me of being disloyal and abandoning them. Well, it was out of self-preservation. How did I get into these relationships? Out of caring for the good things in these worthwhile and excellent people. But I can not weather the storms that arise in these particular close relationships– not with the tools I currently have. How long would it take to teach a 74 year old woman new tricks? I hope others will get smart soon and find out soon enough what is causing a disagreeable and disheartening demise of good friendships and other relationships. Identifying the pattern is the biggest part of stopping the cycle. It can, happily, work the other way. I like the way bread teaches you how to handle it so that the loaf comes out smelling and tasting exactly perfect– a win win. You make mistakes, but you adjust…and you read about yeast and flour and heat and timing and try again. In a while, you wonder how you didn’t make a good loaf of bread! You forget the clumbsies you committed because you and the bread have created a cooperative give and take that works for both of you and produces something special. May the readers of this enjoy mostly good cycles and learn to make the most of them. Like all that snow in the small picture above… it makes the green happen next spring. And the table gets lower and lower. Soon a bench will be moot. This image was unabashedly “lifted” from this excellent blog: http://ruralchatter.blogspot.com/2008/08/public-service-announcement-about-feral.html If it is copyrighted I will remove it, or arrange for special permissions. What a classic photo! Coming in from my morning rounds I ripped off my gloves, ran to the kitchen sink, and turned on the cold water. I let it run to get really cold before putting my fingers under it. It felt SO GOOD. Warm. The pain stopped rather quickly and I was back to normal in about a minute’s time. Flickering through my mind-tapes was a memory of my father showing me how to treat my frostbitten toes many years ago. The pond in our Philadelphia area neighborhood had frozen very solid and I had been skating in my father’s old black, pointy toed, narrow and very floppy ice skates. They were way too narrow and long for my very wide and much smaller feet. The many socks packed into the wrong-shaped skates did little to protect my toes from the cold. Between the single digit temperature outside and the effects of strangulating socks cutting off blood circulation to my toes, and the fact that I skated way too long and then had to walk quite a long way to get home, my poor small feet had turned a deathly white and were — well, frosty! Dad took one look and hurried me to the bathroom where he ran a tub of cold cold water. It did not look inviting, but he said it was what to do to save my feet from tissue damage! He said I would be happy once I put my feet in. At first I didn’t feel much, and then it felt warm. Then my feet began to ache badly, thawing. Then they began to regain their normal color. Soon I could feel that the water was cold. He ran a small amount of warm water into the mix. And soon my feet felt normal again. I did some damage that day that I still (some sixty-five years later) deal with sometimes when my circulation is poor or my feet get chilly. My toes turn white and they ache. And get numb. I massage when that begins to happen and it does help. But a little bit of damage really is there and will not change. Only because I didn’t come home soon enough, when my feet were numb and I was having so much fun skating. I am reminded that life skills are lore that even “Igluk” (our household nickname for the quintessential Cave Man) learned from his father. I don’t remember the Pennsylvania schools having a lesson in frostbite first aid. Surely Alaska will have such a class, but not suburban Philly. These bits of wisdom are taught at parents’ or mentors’ knees, very often in the presence of palpable pain! My head is full of such vignettes that just rest in place somewhere in my brain’s “operating system” like the knowledge of how to walk, or how to talk. Life-lore events make an indelible impression, like certain odors or fragrances (depending on how you like them) bring back whole environments and events. My father leaning over, explaining. The sight of my white feet. The pain. The questions about “tissue damage” and the contemplation of the answers. 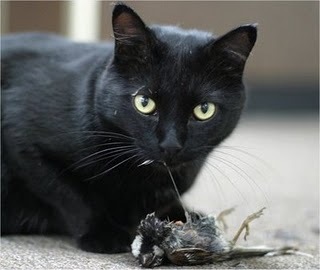 Sitting here, with my mind on parental lessons, my eyes wandered out the window to my neighbor’s driveway where I happened to see the “resident” feral cat catch a meal. I m glad I don’t know what it is, but his companion (who will, I am quite certain, deliver kittens in maybe six or so weeks) came running hopefully over to see if this meal would be shared. No, it will not. The larger cat took his kill to the bushes where he sits now probably relishing the heat from some little recently live high-metabolism body. In this desperate economic climate I read that people are arriving in droves at the SPCA and other shelters with their beloved house pets. They find they have come to a place in the budget where there is not enough to take proper care of extra mouths, and pets are, though loved, expendible. The SPCA is euthanizing record numbers of animals as lovely and trusting as my own two scruffy beloved terriers and my fat and spoiled cat. (who himself was rescued as a practically newborn kitten by me from under the shed one spring day.) People come in with broken hearts and leave the pets behind. I am wondering whether that feral cat across the street will live through the winter. Possibly so. He is large and fat and very good at hunting. He doesn’t share. He may live another year, or maybe he has a lot of parasites that will catch up with him and cut his life short even with good weather. He will certainly live longer than the glossy little fellows at the SPCA whose humans have gone off in tears, leaving them peering out from cages wondering when their owners will return. Who has the better life? So, if there is a point to this blog, I guess it is that the stuff creatures, human and otherwise, learn by the way, as they are smelling the flowers, that becomes the stuff of survival and one’s MODE and CODE of life. If it’s good stuff, like warming frostbitten fingers in cold water so as not to damage the tissue, you live longer. If you aren’t paying attention, or don’t have a parental teacher, you don’t. I was one of the lucky ones. I may be nuts, but I’m still alive, aren’t I?